Livinghouse has a fabulous range of designer freestanding baths made of stone resin, traditional Victorian roll top baths made of cast iron and lovely quality built in luxury baths made of thick enamelled steel. Our high quality baths are suited to both traditional and contemporary bathrooms designs. Within our large range of exclusive baths we offer many styles and sizes and you are sure to find a suitable bath to add design and luxury to your bathroom. Luxury freestanding baths in beautiful contemporary styles & made in rigid stone resin. Within this range we have 19 modern stand alone baths models in many shapes & sizes, including coloured baths in red, black & cream & the choice of air jet spa systems. We have Japanese styled square baths, egg & oval shaped baths plus freestanding baths in wood & natural stone baths for the completely exclusive bathroom. A collection of traditional freestanding baths made in stone resin, cast iron & polished aluminium in traditional Victorian, Edwardian and Art Deco styles. Our roll top baths are in single ended, double ended, slipper & bateau bath designs. We offer very small cast iron baths for smaller bathrooms which are only 1200mm, 1300mm & 1400mm in length plus we have a selection of large baths as well. Our Victorian style stand alone baths can be supplied pre-painted in many colours plus we offer a polished stainless steel finish which looks very similar to chrome. A luxury range of built in baths made in 3.5mm stove enamelled steel which is extremely hard wearing. These high quality back to wall steel baths can be supplied in many sizes & shapes including very small baths to very large baths. We can supply these luxury baths as single ended, double ended, bow fronted & offset baths as well as inset & under hanging baths. Coloured baths available. Livinghouse offers a great range of freestanding baths, from the traditional roll-top bath design to a large range of contemporary free standing baths in all shapes and sizes. We offer a one-stop shop for designer and luxury baths, whether you are looking for traditional or contemporary design to compliment your designer bathroom. The roll top bath collection recreates the bygone Victorian and Edwardian eras, manufactured using cast iron or aluminium with a thick acrylic lining. The stand alone baths are perfect for high-end bathrooms in period houses or to capture the look in a modern setting. Livinghouse's range includes claw footed freestanding baths, a slipper bath and a Bateau or boat-shaped range all in exclusive free standing bath designs. Upping the anti for modern homes, our range of contemporary freestanding baths is second to none for your luxury interior and perfectly designed room for bathing experience. Many of our luxury baths are European and Italian designed with many cast iron, steel and stone resin baths available, which are the preferred materials for luxury baths. With a range of shapes to satisfy any style, from egg shaped and square to oval free standing baths and now we even stock round baths for a central bathroom feature bath. 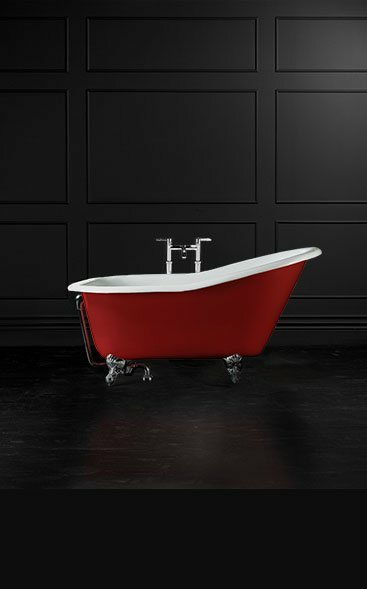 We can offer baths in stunning colours such as dramatic red Red Cleo or Black Vogue plus pristine clean whites. Whatever you choice you will be able to give your bathroom that high quality designer look. The range of designer baths also offers baths in a variety of sizes, including ones that are compact like the Small Mini which is only 1500mm long, or extra long like the Kloodo free standing bath at nearly 1800mm long. The ultra contemporary slipper bath The Reader does just what it 'says on the tin' - offers a stylish and comfortable space for reading, whilst you savour a long soak. The Luca design with its extravagant overhang will make a real design statement in your bathroom design. Baths made from stone resin out-perform cast iron or acrylic baths. All Livinghouse baths are guaranteed for between five and 25 years. All stone resin baths pass the 'knock test'. Good to know.